The dandy style is back. The shades of the new GuidoMaggi dress shoes "Via Tornabuoni", match perfectly with the trendiest colors of this summer 2016. 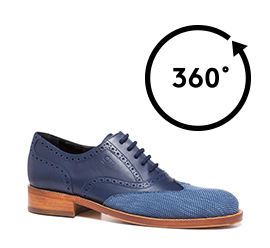 The upper in full-grain leather with fresh blue tones and 100% organic cotton and the soft inner lining made of goatskin, give the "Via Tornabuoni" the charm and elegance that belonged to Oscar Wilde. The insole and midsole in genuine Italian leather and the leather heel with special anti-slip rubber, jointed and sewn by hand, make the "Via Tornabuoni" a handcrafted fashion object 100% Made in Italy. The shoes are customizable by choosing the invisible and anatomic height increaser between 6 cm, 7 cm or 8 cm, depending on your needs.